Need opinion on contract! First time doing this! ForumsArrowRent to Own a.k.a. Lease Purchase, Lease OptionsArrowNeed opinion on contract! First time doing this! This is the first time I am doing a rent to own deal on an out-of-state property I've been wanting to unload for quite some time now. The property is bad shape and would be a good rehab candidate were it not for the property being over 2k miles away from me. I met a local agent a little over a year ago who helped me put the property in the MLS in order to sell it. After quite a bit of time he found a buyer who was very motivated but has had trouble finding the money to purchase the house. He intends to live in it and fix it at the same time. CONTENT: The contract seems quite small and simple and I am not sure if some important clauses are missing. DATE: The initial date is off already being dated on 9/15/16.... I believe based on what the agent has told me the buyer/renter is already in the property and has already been cleaning it up... Could he already be considered close to 60 days late given that I haven't received anything yet? Other than the purchase price, I haven't agreed to anything. I haven't even signed anything. So I don't understand where the $804 dollars are coming to play but that seems too low for me wait over 2 years. TAXES: Are currently $1,100 and listed only once. Renter/buyer has agreed to purchase the property with this "rent" payment however only one amount of $1,100 is listed. The term of this agreement is supposed to go over two years (end in 12/18) so I would expect another 1,100 for the second year plus one payment due this month.. Shouldn't that be included as well? Thus making it 5 tax payments of $550 rather than just two in the calculation ($2,750 instead of $1,100). COLLECTION: What do you guys recommend to collect payments in a timely manner? Any help with this would be greatly appreciated! Should I go with this or tell them to change anything? I personally don't feel too good about this as it feels that 1# I am not getting much for the property, #2 I am waiting over 2 years to get it and #3 I don't feel the numbers add up. Thanks a lot in advance for your help with this!!!! Just when I thought I had seen the most horrible contracts, this is the clear winner. This doesnt even qualify as a rental contract. 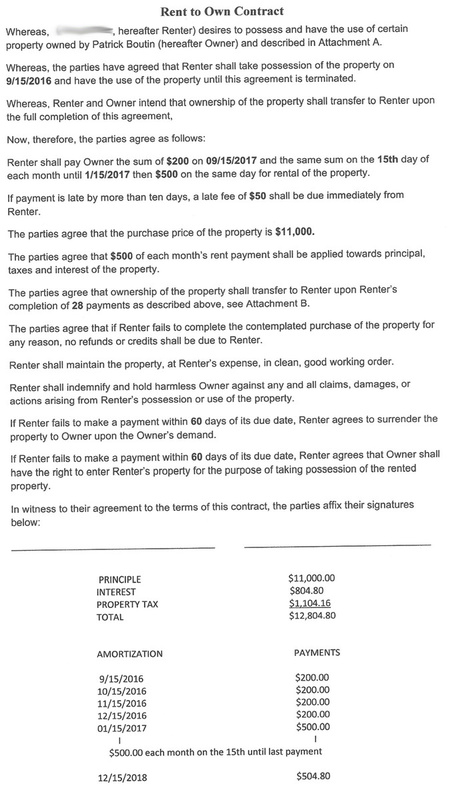 If you were just renting and not least optioning, would you accept this as the whole agreement between you and your renter? Then think about how complicated the lease option part is. The Lease-Option Agreement I created this week is about 14 pages long and covers the things that can go wrong in both the rental part, and the lease option part, and the remedies when each thing goes wrong. Youve hit on the idea that many things are missing. and once you sign a contract you cannot go back and say I thought that these other things should have been in there. You know what you have to do. Do it right. Thank you @Jenifer Levini ! Thank you for agreeing with me. Because the property is very inexpensive I can't justify something that costs too much but I know I can get something better than what this agent sent me. I was doing a search earlier and found https://www.rocketlawyer.com/ in which they help me draft a contract. Yes, Ive seen the Rocketlawyer lease-option agreement. I can say that it is better than the one you were handed. But its still not very good and it isnt specific to California law. Its a generic -nationwide- agreement. In the United States, contract law is specific to each state. Rocketlawyer's agreement is written to not offend the law of any state. That means it isnt blatantly violating the laws of any state (that I know of). It doesnt mean it is following the laws of any state. I cant really go into a long list of all the things that are wrong with that agreement. If you want to hire me to write you a contract we can talk about what you need and the price. If you dont want to spend money to protect your investment then dont contact me. I dont really know how much more advice I can give you. I see this is a small investment in this property. If you want to make a mistake and have a learning experience, this looks like a good one to do that. Hi @Jenifer Levini I was looking a little closer at Rocketlawyer and they do ask you which state this is for so I think that they are State specific which is what you said was important. I am currently debating whether or not I want to do thru with this or just tell the agent I rather keep waiting for a cash buyer. If I decide to go ahead with "rent to own", then I have your contact. Thank you for your advice! Yes. There is a section at the bottom of the contract where the rocketlawyer form fills in which state law will apply in the event of a lawsuit. That does not mean the contract follows that state law. Get a different Realtor, in fact, I'd report them at least to their broker! Tenant doing maintenance on a residential property!!! That's not even an option contract, it's an installment sale! Sign that, do you have the tax money available from the sale? Doesn't really matter what the buyer's intent is, he's living in the house, you have financing compliance issues. The proper jurisdiction will be where the property is located, always, but you may agree to other remedies if that state allows and then you may have civil matters aside from the real estate. Rent to own has been covered on BP pretty well lately, search, just sell with a note and deed of trust and forget the predatory stuff. Even though I don't have advice to give, I must agree this looks like a bad situation. Notice the error in the 4th 'paragraph' which states the first payment date as September 2017?? And you have trespassers in your property if you didn't agree to anything yet... I think that would be my first concern. Why wouldn't you use a lawyer to draft up a contract if you wish to do an installment contract? @Jenifer Levini , good point! I didn't think of it that way. Thanks for clarifying that. @Bill Gulley yes I am starting to see all the possible ramifications if I go thru with this... Thanks! See my "file place" for option to buy forms. Thanks @Lydia S. for pointing that out to me. I didnt' notice the year. I was just thinking that the payment dates were off and would have to be re-set to 11/15/16 at least. Looking at the payment structure below you can tell it was a mistake but that still doesn't make it any better. I didn't think such a small property warranted the expenses of an attorney. I am starting to see all the things that can go wrong thanks to all of you and your valuable input. @Brian Gibbons , I will take a look at the forms! Thanks!